Taste test: Near the top in terms of taste. Hard, crunchy, not overly salty and better than Lay's Classic. This chip won't leave residue on your fingers, and you definitely cannot eat only one. 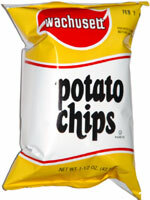 From the package: “Since 1939 the Wachusett Potato Chip Co. has been a family-owned business. Drawing its name, WA-CHU-SETT, from two well known central Massachusetts landmarks near our corporate facility; our name is now recognized throughout New England. 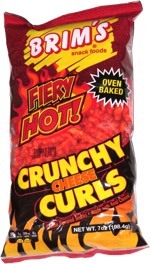 This snack was discovered by Jeremy at Primo's Pizzeria, Somerville, Massachusetts.